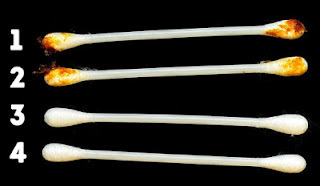 Home / Health and service / Health and service :: Your Earwax Can Tell How Healthy You Are, What Color Is Yours ? 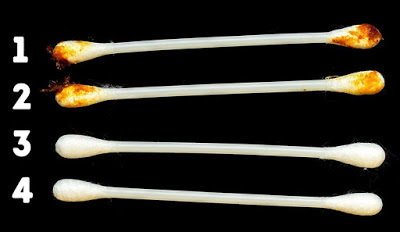 Health and service :: Your Earwax Can Tell How Healthy You Are, What Color Is Yours ? Here are some examples of different wax colors and what they mean for your health. 1. Yellow, wet and sticky. This is the most common type of wax for adults. The wet, sticky texture helps to keep the ear canal from drying out and becoming itchy and it is normal. 6. Dry, white and flaky. 7. Black or dark brown. Earwax that is dark brown or even black can look pretty scary. But the good news is, there’s no need to worry. The dark color may just be the result of an overproduction of wax (like what happens when we’re stressed). It can also mean that the wax has simply been in the ear longer. It’s normal for earwax to come out of our ears from time to time. it’s just part of the natural cleaning process. But when wax pours out of your ears in large amounts and contains pus or blood, it’s a sure sign of a perforated eardrum. In this case, seek medical attention immediately. As you can see, earwax comes in a vast array of colors and most of them are completely healthy even if they don’t look like it. So the next time you’re cleaning your ears, take a close look at that dirty cotton swab. It might make you cringe, but it’s also a great way to identify a problem and deal with it before it gets serious!